A sanitary sewer system and a storm sewer system are not the same. Water that goes down a sink or other inside drain flows to either a wastewater treatment plant or to a septic system for treatment. Storm sewer flows are not treated. 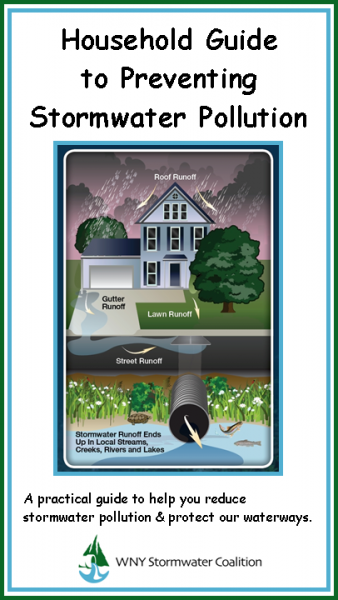 Water that flows down driveways, streets, and outside areas into a storm sewer or ditch flows directly to nearby creeks, fish and wildlife habitats, downstream recreational areas, and drinking water supplies. It's important to remember that any type of surface water runoff, not just rainfall, can run into the storm sewer and collect in the stormwater management system. 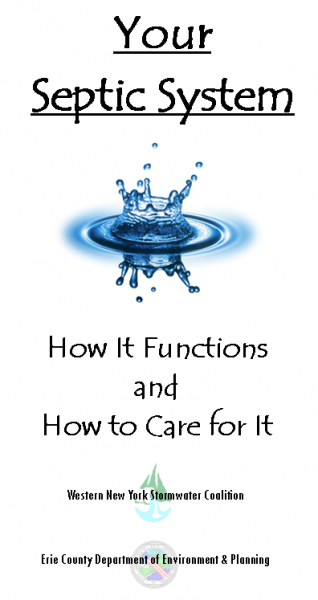 For example, when you wash your car on the driveway, that water, dirt, and grime ends up in the system. That's why we need to be careful with what we put into the storm sewers as traces of all this material can end up in the stormwater system and our local waterways. What can YOU do to prevent stormwater pollution in Western New York? 1. Remember: Only rain belongs in the drain! Don't dump anything down storm drains. Be sure to clear away leaves and debris. 2. Wash your car over your lawn or gravel. This allows the ground to neutralize the soap and grime from your car rather than sending it directly to our creeks and streams. Use biodegradable or non-toxic soap that is phosphate-free. You can also take your car to a commercial car wash where wastewater is either recycled or treated. 3. Keep your car well-maintained. Fix any fluid leaks promptly and make sure to clean up any spills. If you perform your own automotive maintenance, automotive repair shops will accept 5 gallons of used motor oil per resident per day. For more information about the proper disposal of hazardous household chemicals, call (716) 858-6800 or visit the Erie County Waste Management and Recycling webpage. 4. Consider disconnecting your downspouts. 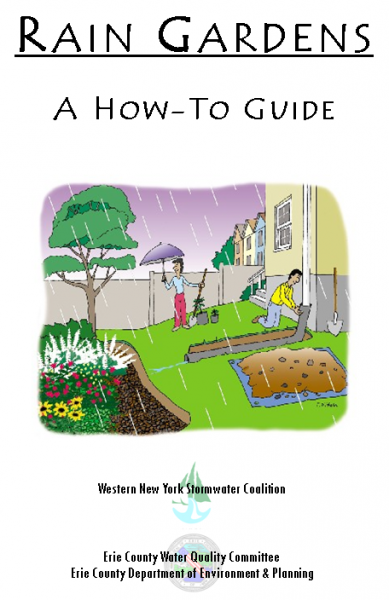 → You can plant a rain garden to absorb stormwater runoff. You can also use a rain barrel to help collect runoff from your roof and gutters to be used on your lawn and garden. 5. Use lawn or garden chemicals sparingly. Choose organic alternatives when possible and check the weather forecast to avoid applying them before a storm. 6. Mow your lawn less often. Try to keep your lawn at least 3 inches in height to minimize weed growth, reduce the need for watering, and decrease the likelihood of pests. Leaving the clippings on the lawn can also help block weeds and retain moisture. Sweep your sidewalks and driveway rather than hosing them down. 7. Plant native, low maintenance plants and grasses. They often have longer root systems, which reduce the amount of chemicals and water needed. Try seeding your lawn with Buffalo Grass (Bouteloua dactyloides) or Northern Dropseed (Sporobolus heterolepis). For native plant listings, try the Lady Bird Johnson Wildflower Center website or the Plants Database. 8. Minimize runoff by not over-watering your lawn and garden. Keep sprinklers on a timer to avoid pooling water. 9. ←Clean up pet waste. Bag up pet waste and dispose of it in the trash to prevent harmful bacteria from washing into local waterways. 10. Be sure to minimize the amount of ice-melt used. Do not over-apply salt. Choose a more environmentally-friendly alternative when possible. 11. Consider minimizing impervious surfaces around your home. Use bricks, gravel, cobbles, natural stone, or permeable pavers instead of asphalt or concrete when possible. A storm sewer system is designed to carry stormwater. If it hasn't rained in 72 hours, it should not be flowing. Call your municipal stormwater contact if it does. 13. Do not drain your pool, spa, or fountain to a storm drain. Allow chlorine to dissipate for several days. Test the water to ensure the residual chlorine is zero before slowly draining to a landscaped area. You may be able to drain to a sanitary sewer. Contact your local municipality for more information. 14. ←Keep your septic system well-maintained to prevent leaks. A leaking septic system can leach harmful bacteria into storm sewer systems and local waterways. It is important to keep your system well-maintained to prevent costly repairs as well. 15. Walk, bike, or share a ride when possible. Driving causes particulates to enter our air. This air pollution can contaminate our rain and end up in our streams and lakes. It is designed to capture and treat stormwater runoff. Answers to many commonly asked questions can be found in this brochure. 17. Install a rain barrel or cistern to capture roof runoff. This helps prevent stormwater from reaching waterways and reduces the potential for pollution. Find out more about our Rain Barrel Painting Contest for middle and high schools!